This driver supports Astro-Physics mounts with GTOCP2 controller (Firmware version E or later) over a serial connection. When using the driver for the first time, ensure to set the correct port under the Connections tab. The primary and secondary telescope (if exists) aperture and focal lengths must also be set in the Options tab. If you do not have a secondary telescope, just put the same numbers as the primary there and click Set. It is also necessary to set the geographic location and park position in the Site Management tab. Do not try parking the mount until this position is defined! Use a park azimuth of "0" and a park altitude equal to your latitude. The "Default" button should pre-populate these fields with the proper values based on the geographic location you have specified. Be sure to save these options using the "Save" button on the Options tab or else the changes will be loss when the driver is closed. The main control tab is where the primary control takes place. To track an object, enter the equatorial of date (JNow) coordinates and press Set. The mount shall then slew to an object and once it arrives at the target location, it should engage tracking at the selected tracking rate which default to Sidereal tracking. Slew mode is different from track mode in that it does not engage tracking when slew is complete. To sync, the mount must be already tracking. First change mode to Sync, then enter the desired coordinates then press Set. Users will seldom use this interface directly since many clients (e.g. KStars) can slew and sync the mount directly from the sky map without having to enter any coordinates manually. The Abort Motion button can be used to stop the mount at any time. Four tracking modes are supported: Sidereal, Solar, Lunar, and Custom. When using Custom mode, the rates defined in Track Rates shall be used. Tracking can be enganged and disenganged by toggling the Tracking property. Mount parking and unparking is controlled by the Parking property. The Use Pulse Cmd property can be enabled to guide the mount through the communications interface and eliminates the requirement of using an ST-4 cable to guide the mount. The Firmware property shows the detected firmware version of the mount controller. The Options tab is used to set debugging and other configuration options, as well as being able to load and save configurations. GPS: If using a GPS driver (e.g. INDI GPSD) then enter its name here. EQMod shall sync its time and location settings from the GPS driver. PEC Playback: Controls whether PEC correction are enabled. GOTO Rate: Rate of motion for GOTO operations. Swap Buttons: Reverse direction mount moves. Sync: Controls whether SYNC or RECAL is used for syncs. The recommended setting is :CMR# to use RECAL! Time, Location, and Park settings are configured in the Site Management tab. Enter the desired AZ & ALT values for the custom parking position, then press Set and then press Write Data to save the new parking position. Slew the mount to the desired parking position, then press Current to sync the encoders position to this value, and then Write Data to save. You can park the telescope by clicking on Park on the Main Control tab. If the telescope is already parked, click the park button to unpark it. You cannot perform any motion unless the telescope is first unparked! Guide Rate: Guiding Rate for RA & DE. Example: 0.25 means the mount shall move at 25% of the sidereal rate when the pulse is active. The sideral rate is ~15.04 arcseconds per second. So at 0.25x, the mount shall move 0.25*15.04 = 3.76 arcsecond per second. When receving a pulse for 1000ms, the total theoritical motion 3.76 arcseconds. The recommended value is 1.0x. 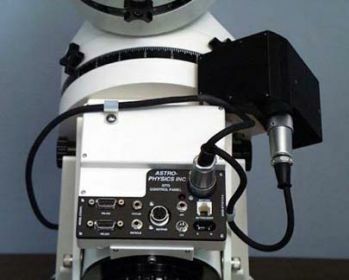 When you park the mount it is recommended to disconnect the driver from the mount and power the mount down as well before connecting again. If you find a bug, please report it at INDI's bug tracking system at GitHub.